In his book Yofi Shel Ivrit (chapter 31), Avshalom Kor points out a distinction I had never really paid attention to before: the difference between rashut רָשׁוּת and reshut רְשׁוּת. Reshut (with a shva) means "permission". It comes from the root רשה meaning "to authorize, permit, allow". 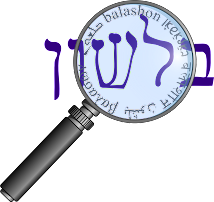 It is related to the word rishayon רשיון - "license". Reshut hadibur רשות הדיבור - "permission to speak". "The legislative authority (rashut without an alef) is under the chairmanship (rashut with an alef) of Barak ben Avinoam". Several scholars and lexicographers derive rashut רשות from base רשה ( = to empower, authorize). Whether rashut and reshut are related or not, there certainly are cases where it is not clear which word is intended (particularly in non-vowelized texts.) For example, in the Mishna Moed Katan 3:3, we find the term אגרות של רשות. Kehati points out that the commentaries disagree whether it should be read igrot shel rashut or igrot shel reshut. Similarly, in the Talmud, Eruvin 41b, the term והרשות appears. Rabbeinu Chananel says it means "authority", but Rashi says it might have other explanations, and it is difficult to say. What about רשות היחיד and רשות הציבור - private domain and public domain? Should it be rashut hayachid and rashut hatzibur OR reshut hayachid and reshut hatzibur? Kor explains that the correct form here is reshut. In the private domain - only the individual has permission to act, whereas in the public domain the entire public can do as they please. One more "rashut" word that Kor doesn't mention is rashut רשות - "poverty", coming from rash רש - "beggar".